St. Mark's Child Care Centre was created to respond to the needs of our community and the needs of each individual child. Nestled in the tranquil settings of the Veneto Centre park, we have created a learning environment in which all senses are stimulated in an interactive Learning Centre. Children are given the opportunity to develop through play and interaction as well as through formal thematic teaching units. 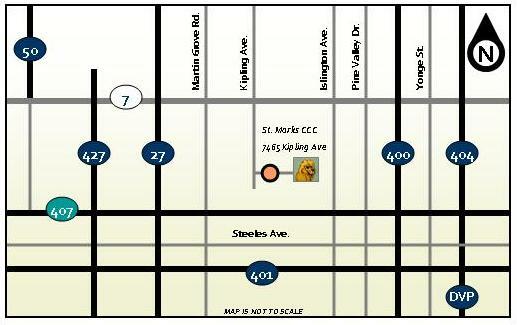 The St. Mark's Child Care Centre is located within La fenice Learning Centre. It is a modern state of the art teaching facility with children's library and fully equipped computer lab. It has five classroom facilities and a nursery complete with in-house kitchen and food preperation area that exceed every standard of the Ontario Ministry of Community, Fmaily and Children Services. Qualified Early Childhood Educators and Assistants are on staff. Our Director, Josie Locilento and teachers come with a long history in the field of Early Childhood Education and a proven track record. The students, not only receive quality care, but they get the head start they need to enter kindergarden with confidence. Located at 7465 Kipling Avenue, Woodbridge, Ontario.